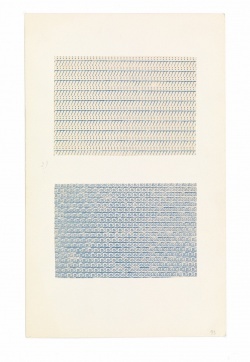 Anni Albers, Typewriter study to create textile effect, n.d. Typewriter printing in blue ink on paper mounted on board, 27 x 16.8 cm. 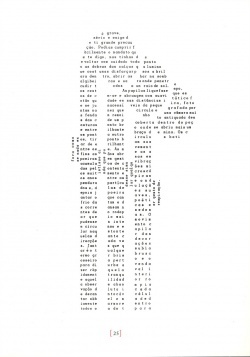 Made on Olivetti Lettera 22 typewriter. (Source). Printed in 1974 monograph by Albers. More. 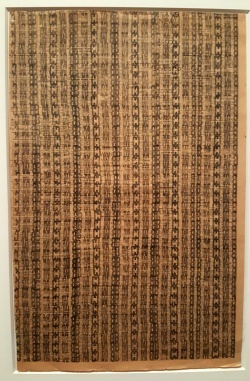 Ruth Asawa, Untitled (BMC on newsprint), c.1946-1949. Stamped ink on newsprint. Created during Asawa's studies with Anni Albers at Black Mountain College. More, , , . 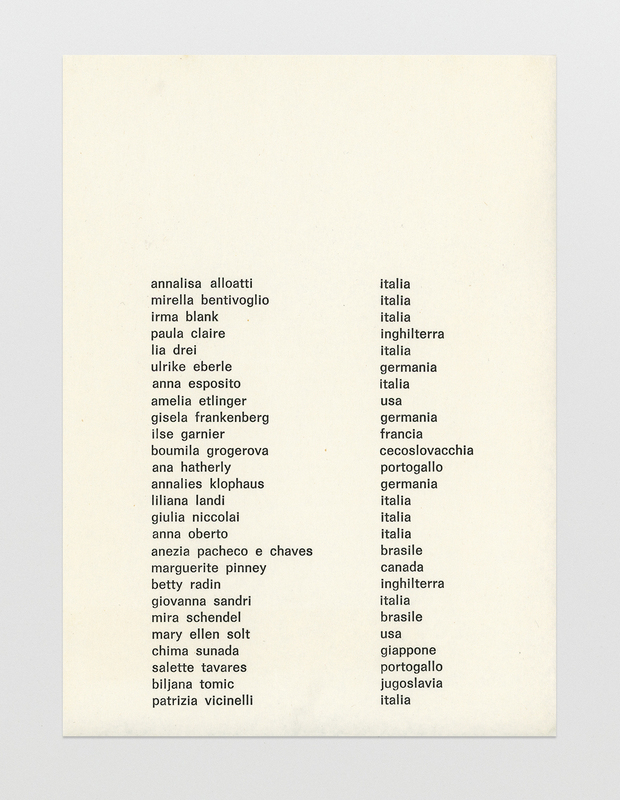 Lygia Pape, Vem [Come], Poema-objeto [Poem-Object] series, 1957. Tempera on cardboard. Photo: Paula Pape. More works from the series. Salette Tavares, Os efes, 1963. (Source). Gulbenkian. Artist's statement, 1973. Mary Ellen Solt, Moonshot Sonnet, 1964. 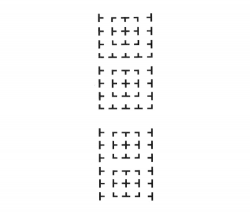 The poem is "composed from reformatted diagrammatic-codes initially used by NASA-engineers to plan and execute the moon landing. The engineers placed the diagrammatic-codes over photographs of the lunar surface, and Solt abstracted the diagrams without any photographic reference. Using the codes, she transformed the result into a sonnet, with the codes appearing in “exactly fourteen “lines” with five “accents,”” a Petrarchan or Italianate sonnet" . 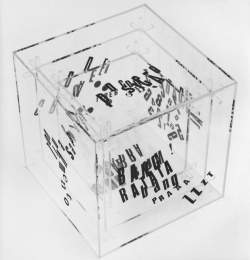 Bici Hendricks, Punctuation Poems, New York: Black Thumb Press, 1966, 14 x 8.5 cm. 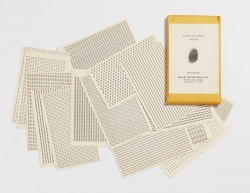 An envelope with a white label containing 20 printed cards, each consisting of a single typewriter character. (Source). 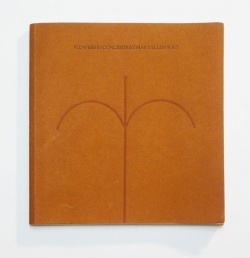 Mary Ellen Solt, Flowers in Concrete , 1969, [1+11] plates, 92 x 61 cm, PDFs. Includes poems Forsythia, Lilac, and Geranium. 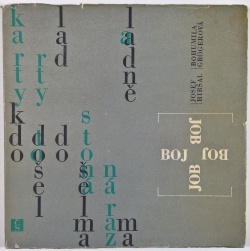 Cover of JOB-BOJ, collection of poems by Josef Hiršal and Bohumila Grögerová, Prague: Československý spisovatel, 1968, 130 pp. 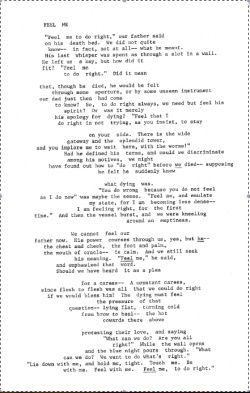 Mary Beach's poem in The San Francisco Earthquake 1:3, 1968. 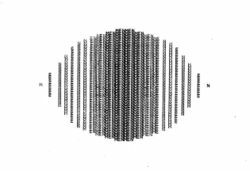 Tamara Janković, Šesta Dimenzija 16 (Sixth Dimension 16), in Signal, no. 1, 1970. Janković was a member of the Belgrade-based Signalist group of experimental poets in the early 1970s and was on the editorial board for the group’s magazine, Signal. 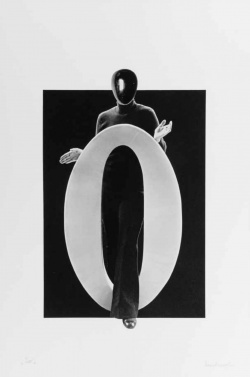 Her use, here, of numbers, letters, and the Pierre Cardin logo reflects the Signalist goal to explore symbols and imagery in new poetry that transcends national languages. May Swenson, Feel Me. From Swenson's collection of visual poems, Iconographs, 1970. Drafts. Poetry review. Poems by Marina Abramović published in Signal, no. 4-5, 1971. 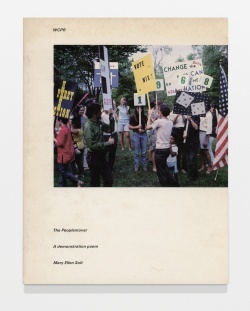 Mary Ellen Solt, The Peoplemover 1968: A Demonstration Poem , 1978, 114 pp. 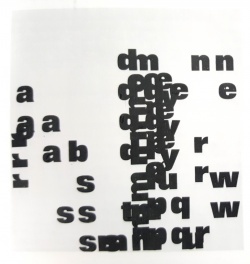 Reproduction of the texts and posters (arranged in the form of concrete poems) from Solt’s performance. Neide Sá, Transparência, 1968. Acrylic, serigraphy, 20 x 20 x 20 cm. (Source). 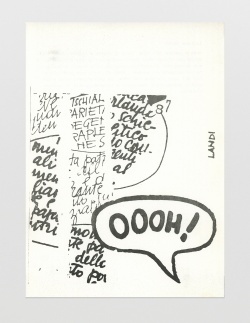 Ewa Partum, Active Poetry, 1971-1973. 8 mm film, b&w, no sound, 5'53". Documentation of five actions in the surroundings of Warsaw. 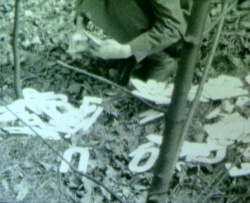 For her action in 1971, "the artist cut up a single page of James Joyce’s novel Ulysses and scattered the individual letters in a pedestrian arcade in Warsaw. The letters became distributed through the space creating new texts and chance meetings as passers-by moved around the arcade. 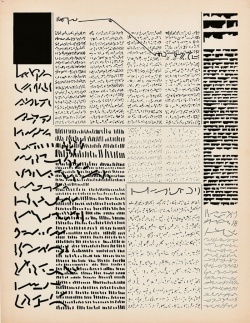 The concept marked a turning point in Partum’s career and is one with which she has continued to play in order to critique the means and modes of textual production. Partum went on to create a series of works using letter cut-outs, often releasing them into natural spaces, including the ocean and a hilltop." . View film on Filmoteka. Tate. Reina Sofia. Generali. 2006 re-creation at Tate. Mirella Bentivoglio, L’(assente), positivo/negativo, segno/figura [The Absent One, Positive/Negative, Sign/Figure], 1971. Serigraph on paper, 62.55 x 48.26 cm. (Source). Mirtha Dermisache, Diario No. 1, Año 1, 1972. Chinese ink and marker on paper, 46.4 × 35.6 cm. Source. 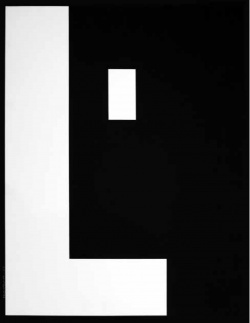 Mirella Bentivoglio, E = congiunzione [And = Conjunction], 1973. Serigraph on paper, 20.96 x 29.85 cm. (Source). 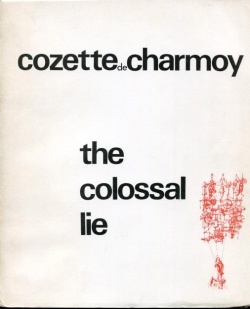 Cover of Cozette de Charmoy's collage novel The Colossal Lie (Collection OU 4), 1974. Mary Ellen Solt's contribution (ZigZag) to Arti visive. Poesia visiva, 1976. (Source). Liliana Landi's contribution to Arti visive. Poesia visiva, 1976. (Source). 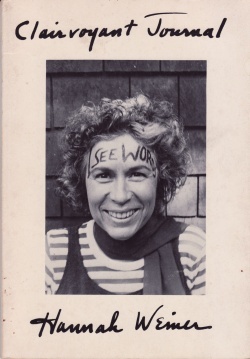 Hannah Weiner, Clairvoyant Journal 1974: March—June Retreat, Lenox, MA: Angel Hair Books, 1978, JPGs. Commentary. Mirella Bentivoglio, Io [Me], 1979. Photo­mech­anical print on paper, 60 x 40 cm. (Source). 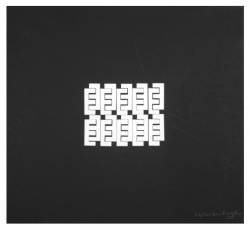 Mirella Bentivoglio, Moduli a E [E Combinations], 1980. 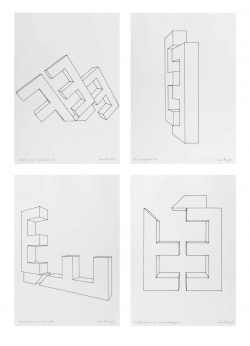 Ink on paper drawings after 1977 wooden constructions, 29.53 x 20.96 cm. (Source). Ruth Wolf-Rehfeldt, Men, 1984. (Source). 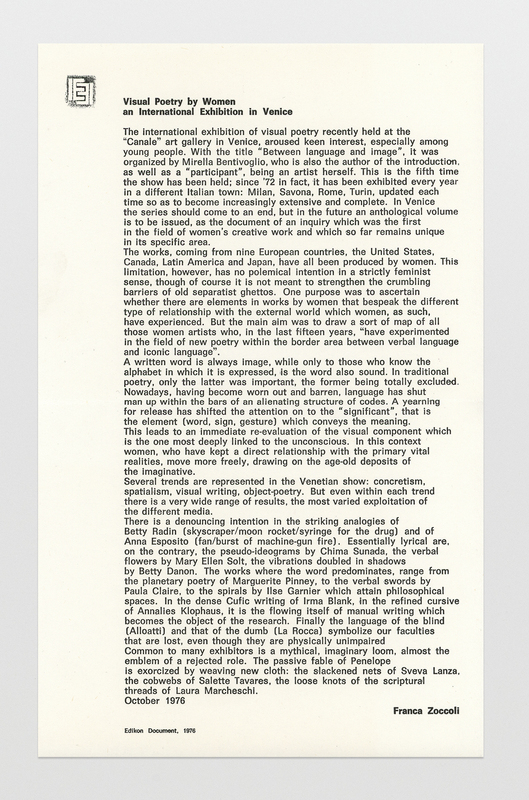 Irma Blank, Radical Writings, Rosa geatmet, rosa gechrieben [Pink Breathed, Pink Scripted], 1987. 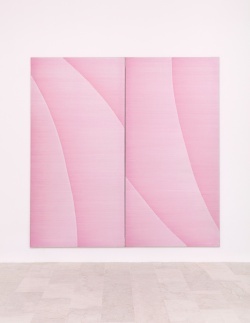 Acrylic on canvas (diptych), 2 × 2.4 m. Photograph: C. Favero. (Source). Ana Hatherly, Poeta chama poeta I, 1989. Indian ink on paper, 23 x 30 cm. Serralves. Ana Hatherly, Le Pli - No 1, c.1993. Source & more. 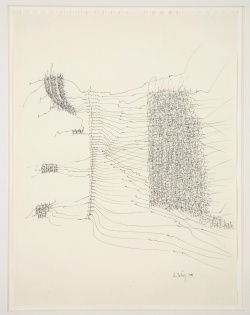 Irma Blank, Osmotic Drawings D-7, 1996. Acrylic on paper, 23 × 30 cm. Photograph: C. Favero. (Source). M. NourbeSe Philip, Zong! #15, from Zong!, Middletown, CT: Wesleyan University Press, and Toronto: Mercury Press, 2008, 211 pp. Audio. 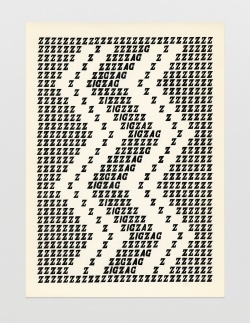 Natalie Czech, A hidden poem by Jack Kerouac #2, 2011. C-Print. 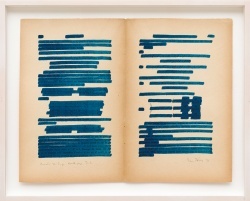 In her series, Hidden Poems (2010-2013), Czech mines texts from a variety of sources, purposefully seeking or subconsciously finding in them words and fragments, which through a process of selection, repetition, and erasure, coalesce into poems by Frank O'Hara, Aram Saroyan, E.E. Cummings, Velimir Khlebnikov, a.o. 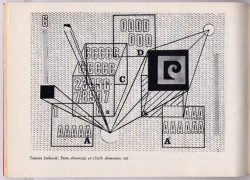 See also Women in Concrete Poetry channel on Are.na. 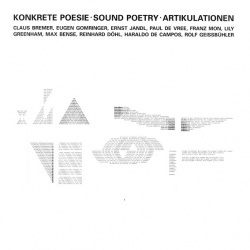 Anastasia Bitzos, Konkrete Poesie, Sound Poetry, Artikulationen, 1966, vinyl LP; 2004, CD. 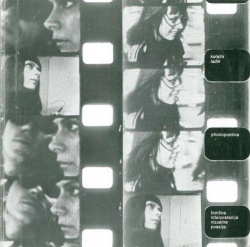 A selected documentation of the performance organized by Anastasia Bitzos on 26 May 1966 in the Kunsthalle Bern, Switzerland: "Konkrete Poesie, in Tonband, Lichtbild und Lesung". 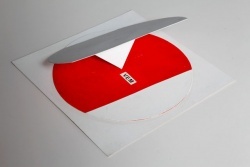 The production of the performance, the selection and the compiling of the record made by Anastasia Bitzos. Compositions by Bremer, Jandl, Gomringer, Mon, de Campos, Greenham, Bense, De Vree, Döhl, Geissbühler. Discogs. Katalin Ladik, Ballada az ezüstbicikliről (1962-1968), Novi Sad: Forum Könyvkiadó, 1969. Texts. 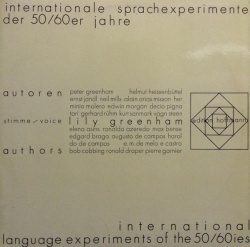 Lily Greenham, Internationale Sprachexperimente der 50/60er jahre / International Language Experiments of the 50/60ies: Tendentious Neo-Semantics 1970 in English, Frankfurt am Main: Hoffmann, 1970, vinyl LP. Lily Greenham reading poems by Peter Greenham, Jandl, Mills, Morgan, Cobbing, Gamier, Bense, de Campos, Braga, Pignateri, Rühm, Arias-Misson, Heissenbüttel, Molero, Sanmark, Steen, and her own poetry. Discogs. 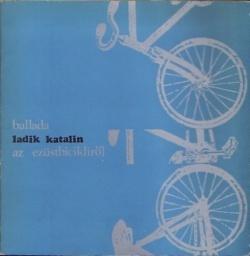 Katalin Ladik, Phonopoetica (Phonetic Interpretations of Visual Poetry), Belgrade: Galerija studentskog kulturnog centra, 1976, 7" vinyl. Discogs. .
Lily Greenham, Lingual Music, Paradigm Discs, 2007, 2xCD. 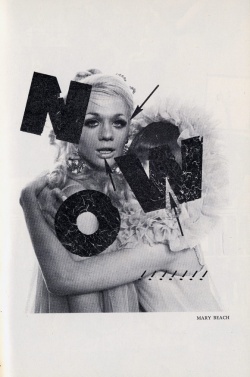 Works from 1968-1974. Discogs. 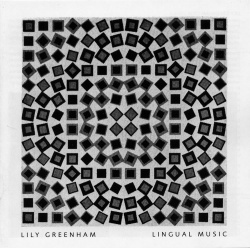 Lily Greenham, "Lingual Music", in Kontextsound, ed. Michael Gibbs, Amsterdam: Kontexts Publications, 1977, p 22. 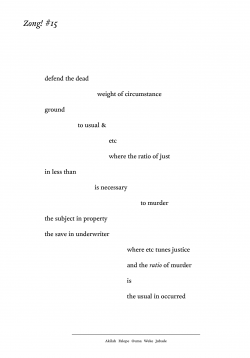 Mary Ellen Solt, "Concrete Steps to an Anthology", in Experimental, Visual, Concrete: Avant-garde PoetrySince the 1960s, eds. K. David Jackson, Eric Vos, and Johanna Drucker, Amsterdam: Rodopi, 1996, pp 347-352. 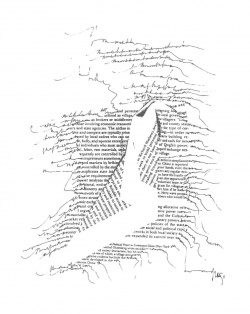 Maria Demon, Rachel Blau DuPlessis, "Desiring Visual Texts: A Collage and Embroidery Dialogue", Jacket2, 25 Mar 2013. Arti visive. Poesia visiva, 1976. 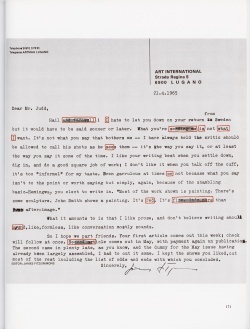 Paula Claire Archive; fromWORDtoART - International PoetArtists, an international archive of sound and visual poetry, est. 1983. The archive containing over 5,000 books, poem objects, exhibition catalogues, cassettes and CDs, was gathered by exchanging Claire's Little Press publications with fellow international poets, and is the basis of illustrated talks and displays. Elisabeth A. Frost, "Visual Poetics", in A History of Twentieth-Century American Women's Poetry, ed. Linda A. Kinnahan, Cambridge University Press, 2016, pp 339-358. 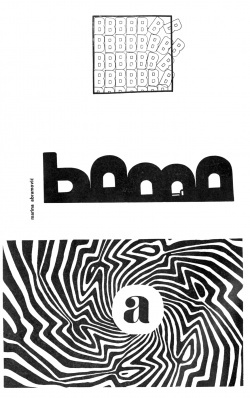 Avant-garde and modernist magazines, Artists' publishing, Vorticism, Dada, Zenitism, Estridentismo, Surrealism, Concrete poetry, Zine culture, Afrofuturism, Digital libraries, Code poetry, Conceptual writing, Alternative literature. This page was last modified on 22 March 2019, at 09:04.